What do you get when you take two always "on the go" triathletes and put them on an island where relaxation is an art form? Read on and find out. Not only was I planning a New Jersey wedding from San Francisco and wrapping up our fiscal year end at work, but I was training for one of the San Francisco Bay Area's most well known "long course" triathlons: Vineman Ironman 70.3, which we completed within days of our wedding! 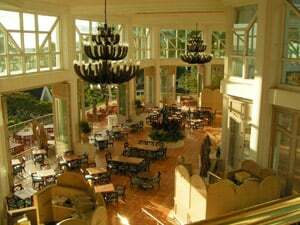 My husband, a general manager for an onsite restaurant company that provides cafe and catering services to corporations, colleges and universities, was also working around the clock to create the first "green" café in a corporate setting in Silicon Valley. He too was participating in the race with me. We got married on 8.8.08 in Northern New Jersey, where we are both originally from. We chose the date because of all of the luck it could potentially bring us and because it was the first day of the Olympics- something that signifies all of the energy we have as a couple. We even came into the reception to the Olympic theme song, which was caught on film by the local newspapers! We got married on Friday, August 8th and a few days later left for our 11 day, 10 night honeymoon to Maui, Hawaii on August 11th. We at first tossed around the idea of going to Italy or Thailand or Peru for our honeymoon, but after we gave it thought...we agreed that we wanted to give ourselves a much deserved break instead of running around a foreign country. We wanted to honeymoon on the island of Maui, Hawaii because of its beauty and grandeur as well as the opportunity it provides for relaxation-something we thought we would need after all of the stress of traveling across the country to get married. We chose Maui over the other Hawaiian islands because it seemed that Maui had everything we wanted; activities, beauty, good food and fun things to do all within the same general vicinity. Since we are unsure how long we will be living on the west coast, we wanted to travel there. We used the Lonely Planet guide as well as word of mouth to determine where we would stay and visit while in Maui. Living in the Bay Area it seemed like everyone except for us had vacationed in Maui! So we received tons of advice! For the first 8 nights part of the vacation, we stayed at the Westin Ka'anapali Ocean Resort Villas on Maui for $2,500 for the week. We chose to stay at the villas over a hotel because of the amount of space we had and the ability to make our breakfast and lunches so we could splurge a little bit on dinners. We absolutely loved where we stayed. When we walked into our newly furnished, roomy one bedroom villa, we were really impressed! It had a stocked kitchen with all of the latest appliances, a living room with a comfy couch, flat screen TV (to watch the Olympics) a small dining area, a bathroom with a Jacuzzi, his and her sinks, a stand-up shower, and a king-sized bed. We visited the local supermarkets to purchase, delicious Hawaiian coffee, cereal, lunchmeats, cheeses and wines to make our breakfast and lunch and went to dinner at several fantastic restaurants not too far from the Westin. One of our favorite things about our room was its sliding door that opened right on to the beautiful "L" shaped pool. On our first night there, we ate the first of many delicious meals at the restaurant within the Westin. They sat us at a remarkable table perched on a cove that was lightly stroked by the Hawaiian breeze that rolled off the ocean 100 yards away. Our table also over looked an illuminated coy pond. The sounds of the fish swimming, the champagne bottle popping, and happy vacationers walking about was the perfect kick off of a beautiful vacation! Since we are folks who are constantly on the go, on first full day on Maui consisted of determining the types of activities the resort had to offer. We started out swimming and snorkeling in the crystal blue Pacific Ocean waters and enjoying the colorful fish. We saw fluorescent yellow fish, orange fish, and blue striped fish just to name a few. We were so intrigued by the fish that my husband dove deep down and shared some of his foccia bread from his lunch with the tropical fish. Hundreds of them swarmed around him eager to get a taste of the bread. As I took photos of him with our waterproof camera, I felt their fins lightly brush my legs and arms as they hurriedly swam toward him! Good thing we could breathe without taking our eyes off of the beauty! This just made us want to experience more of the marine life! We made an appointment for an introductory scuba dive with the Westin's instructor the very next day! This was also part of the TravelersJoy.com registry at $125 per person. The following day, we embarked on a kayaking/snorkeling tour on the opposite side of the island. The snorkeling on that side of the Island offered new and different marine life including several large sea turtles! This was also part of our registry at $100 per person. Having all of these activities at our fingertips was perfect for our sporty lifestyles! 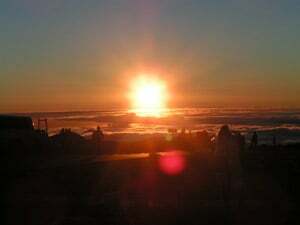 We learned from the books about Maui that we absolutely had to watch the sun rise a top Haleakala National Park. A labor of love, we awoke at 2am and started driving from our hotel set to arrive on top of the 10,000 foot high mountain by 3am! The drive up the mountain seemed endless... like we were driving to the heavens! Around each bend, I thought we were almost there, but rarely was that the case. At the top, the air was thin and cold and the night was dark. As we peered out from the top of the mountain, the clouds seemed to be at eye level with us and they looked like fluffy snow mountains. Soon enough the enormous ball of fire rose little by little before us lighting up the sky. We felt like we were in a science fiction movie! Witnessing something like this forced us to realize the true force of nature. We were told to dress warmly, which was sage advice, as the air temperature was about 40 degrees. I would recommend this because when ever are you going to have an opportunity to see such a sight? There was no charge to witness this beauty. The books also mention the Road to Hana...known by honeymooners of the past as "the Road to Divorce." The one lane, windy road is about 50 miles one way. We were told that there would be delicious culinary island specialties for purchase at many fruit stands along the way. Being connoisseurs of food, we went on a somewhat empty stomach ready to be immersed in the culture of the people of Hana. However I must tell you some very important information...the most exciting part of the road is within the first 20 miles (fresh water falls and beautiful black sand beaches) and secondly, there may or may not be food along the way. Unfortunately for us everything was closed...which we thought was strange for a Saturday in August! We luckily purchased a small banana bread early on in our journey that we rationed off throughout the 6 hour ride. At mile 40, although there were no more attractions to see, we wanted to continue along the road so that we can make a loop and get back to Maui to get some dinner. However, much to our chagrin, we had spent 3 hours traveling to that point only to find out that the loop had been closed for two years due to falling rock. Unfortunately that was not indicated on the map, nor was it mentioned in our book on Maui. So we had to head back starving, driving wearily along the windy roads in the darkness! Since we were so fortunate to find TravelersJoy.com, the generous gifts of our friends and family allowed us to treat ourselves to one night at the well-known Grand Wailea Resort on the Wailea side of the island. The room itself was $700/night. We were greeted with enthusiasm and politeness from the staff from the minute we arrived. We felt like celebrities! The hotel décor was a luxurious blend of Western and Polynesian décor, beautiful dark wood furnishings and 37" flat-screen televisions. The bathrooms included beautiful artwork and marble vanities and sinks. The grounds were beautifully groomed with immaculate white furniture and a small chapel for weddings. The pools were very impressive - seven separate pools including an adult pool, a baby beach, seven waterslides, a water elevator, caves, waterfalls and Jacuzzis. "People watching" at this hotel was half the fun! We started our day at the resort in the adult pool where no children are allowed, the first pool we had been in where there was an age limit. As we sipped lava flows we over heard conversation similar to the ones on the show "Housewives of Orange County". We looked at each other in agreement that this was not our scene. So we scurried over to the "kids" pool, took a ride on the Tarzan swing and slid down the faux waterfall right to the swim up bar where the friendly bartender working the bar that was set in a cave like structure handed us each a mudslide to try. My husband turned me and said, "Do you realize that our biggest concerns of the week were whether we should lounge at the pool or at the beach and whether we should enjoy a Lava Flow or a Mai Tai...."
Could we ever get back to our 50 hour per week jobs and our 20 hour per week triathlon training schedule after this type of relaxation? The answer is...getting back into the swing of things was sure tough, but it was certainly the battery recharge we needed and because of TravelersJoy.com we didn't break the bank on our honey moon. When we got home, we signed up for the full Ironman in Cozumel Mexico for 2009, my husband is opening his second "green certified" cafe and I am about to get a promotion! Altogether we spent $4,000 on a honeymoon that would have cost $8,000 us if not for TravelersJoy.com. We now have enough money to travel to Cambodia this March! I would highly recommend Maui, Hawaii to anyone who is looking to recharge their batteries!